Randolph Street exists in a small Iowa town. It is the setting for stories of love, history, nostalgia, tragedy, and humor of five generations of the author’s family. There were surprises in store for the author, her brother, and sister as they cleared out the family home at 608 Randolph Street, the house where their parents had lived for almost sixty-nine years. Her stories about family, friends, and events are set against an earlier time in America. You will meet the people who lived in the small community during the 1940s and 50s, read about the town with the red brick streets, and meet Carolyn’s extended family and the neighbors on Randolph Street. 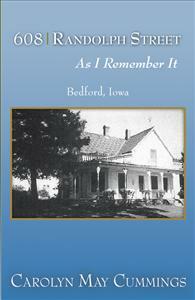 You will understand the nostalgia she feels for the little town of Bedford, Iowa, the small town with the big heart. I found Ms. Cummings stories to be not only extraordinarally charming and well-written, but I wanted to just keep reading on and on. Her writing is so descriptive that I could easily envision myself as one of the participants. If you are a midwesterner and especially from a small town, I can guarantee that you will be able to relate to so many of the stories. Ms. Cummings stories later in the book are so heart-felt and provided such love and dignity to both of her elderly parents. Her gift for writing is just that; a rare and exceptional gift. I highly recommend her book to everyone, young and not so young.